Tickets are on sale now to see Ink at the Samuel J. Friedman Theatre on Broadway. We can always give thanks to London for exporting world class dramas and comedies to our shores and there are many reasons to be grateful for James Graham’s Ink – a 2018 Olivier Award nominee for “Best New Play”. 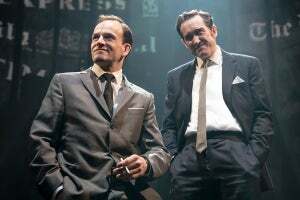 Set in 1969, the play follows media mogul Rupert Murdoch on his uncompromising mission to dominate the British printed press with a newspaper that would appeal to the UK’s Everyman by the masses. After the purchase of The Sun and the hiring of Larry Lamb as his unlikely editor, we discover the lengths Murdoch, Lamb and his team of reporters will go to (and the depths they will stoop to) to beat the competition. Ink began its life Off-West End at the immensely influential Almeida Theatre under the helm of its Artistic Director (and Tony Award nominee) Rupert Goold. Bertie Carvel, a Tony Award nominee in his own right for his deliciously menacing portrayal of headmistress Miss Trunchbull in Matilda the Musical, originated the role of Rupert Murdoch at the Almeida in the summer of 2017 and, after rave reviews, reprised the role during its West End transfer at the Duke of York’s Theatre from September 2017 to January 2018. He also went on to win his second Olivier Award (his first being for Matilda) at the 2018 ceremony. Luckily for New York audiences, Bertie Carvel has agreed to return to Broadway to reprise that Olivier Award-winning performance and he is joined in the cast by fellow Brit Jonny Lee Miller, himself an Olivier Award winner for his breath-taking portrayal of both Victor Frankenstein and his creature (alternating the roles at each performance with Benedict Cumberbatch) in the National Theatre’s 2011 production of Frankenstein. To American audiences, he’s perhaps best known for his TV role as Sherlock Holmes (opposite Lucy Liu as Dr. Watson) on CBS, as well as his cult role as Sickboy in Danny Boyle’s two “Trainspotting” films. Playwright James Graham previously made his Broadway debut, penning the book for the 2015 Broadway premiere of Finding Neverland, but makes his straight play debut with Ink. He made his Off-Broadway debut in the summer of 2016 with Privacy, starring Daniel Radcliffe, at the Public Theater and in London, he is widely known for his Olivier Award-winning comedy Labour of Love and his Olivier-nominated political masterpiece This House. Manhattan Theatre Club presents the American premiere of Ink as part of its 2018-2019 Broadway season as a co-production with the Almeida Theatre and Sonia Friedman Productions. Stop the press and book yourself a ticket, before the ink runs dry! It’s 1969 London. The brash young Rupert Murdoch purchases a struggling paper, The Sun, and sets out to make it a must-read smash which will destroy - and ultimately horrify - the competition. He brings on rogue editor Larry Lamb who in turn recruits an unlikely team of underdog reporters. Together, they will go to any lengths for success and the race for the most ink is on! Manhattan Theatre Club's American premiere of Ink, written by Olivier Award winner James Graham and directed by Tony Award nominee Rupert Goold, begins previews at the Samuel J Friedman Theatre tonight, ahead of an official opening on April 24. The limited engagement was yesterday extended through to June 16, 2019. Manhattan Theatre Club has announced a 1-week extension ahead of tomorrow's first preview performance of the American premiere of Ink, written by Olivier Award winner James Graham and directed by Tony Award nominee Rupert Goold. Originally scheduled to conclude its limited engagement at the Samuel J Friedman Theatre on June 9, 2019, the production will now end its run on June 16. An official opening is scheduled for April 24. Manhattan Theatre Club has now confirmed complete casting for the forthcoming American premiere of Ink, written by Olivier Award winner James Graham and directed by Tony Award nominee Rupert Goold, which is set to play a limited engagement at the Samuel J Friedman Theatre from April 2 to June 9, 2019, with an official opening scheduled for April 24.